The land of kilts and bagpipes has always stood a little bit apart in its northern highlands, yet its people sweep down into history in colorful ways that illustrate many puzzling events from history. 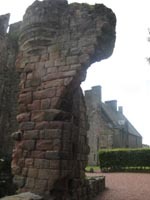 Among those people are the St Clairs of Roslin just south of Edinburgh, the builders of the famous Rosslyn Chapel of Da Vinci Code fame. So of course I had to stop by and visit. Near that enigmatic church is the ancestral home of the St Clairs, which is still open as a place for lodging provided by the Landmark Trust. The legends about the Knights Templar that swirled around Scotland found reality far to the south in England. 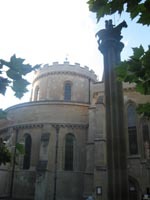 There the Templars built a grand Preceptory and one of their well-known round churches, which still stands today in the part of London known simply as Temple. 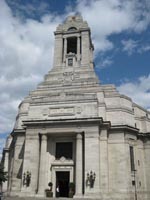 Also in London, the Freemasons emerged from secrecy in 1717 to see and be seen, and they established a Grand Lodge. It was not long before they erected a suitable building on Great Queen Street for that lodge, where its latest reincarnation still resides. Lebanon is awash in history, from Tripoli and Byblos in the north to Tyre and Sidon in the south. Beirut, located in the heartland of Lebanon, was once the Paris of the East, and the financial center of the Middle East. Then the 1975-1990 fighting caused so much damage that buildings had to be pulled down. The only good news from this was that it brought to light Phoenician ruins immediately beside the brand new buildings being raised in the downtown area. In Tyre it is still possible to see the quintessential image of the Phoenicians, resurrected by one of their descendants. The local boatmaster built a boat of Lebanese cedar using the ancient mortise-and-tenon method. There is not a single nail in it. He was good enough to give me a walk-through two days before it was launched. Two days later I happened to be in Byblos when his son decided to pull in there on the boat's maiden voyage! Phoenician reminders seem to appear wherever you go. Who can think of Egypt without immediately imagining the broad Nile River wending its way from the southern border of that land past ancient temples and pyramids. Flowing through the heart of Cairo, the river then fans out into the wide Delta. The Great Pyramids draw one closer, to experience this surviving seventh wonder of the world. The second-largest city there is Alexandria on the Mediterranean shore. The ancient settlement included a port on Pharos Island whch was frequented by the early Phoenicians. The modern city of Alexandria was later founded by Alexander the Great, and became home to the Greek pharaohs who ruled after him until the time of Cleopatra. The former island of Pharos, now attached to the mainland, is still the center of attention -- whether considering the busy shipping harbor to the west, or the elegant Corniche along the civic harbor to the east. Egypt is a land of many faces, and there is an intriguing history behind each of them. Interesting parts of that history were told to me by Ahmed Abdel Fattah, General Director of Museums and Antiquities of Alexandria. The legacy which Santorini leaves for us is without question a beautiful one. Beside the dramatic plunging cliffs, clear blue sea, sunsets lighting clouds, villas and restaurants on high vistas brushed with warm breezes -- there are also more ancient gifts. The city at Akrotiri became covered when Santorini's volcano massively erupted around 1628 BC. That sealed it in a time capsule which was only opened by excavators in 1967 AD. The Phoenician colony which lived here had played an essential role in early trade across the Aegean. The beautiful wall paintings tell us a great deal about the people who thrived here so many years ago. Christos Doumas, the director of these ongoing excavations, told me there is more work to be done and more treasures to be revealed. The mention of Crete immediately brings to mind the great palace at Knossos, the heart of the regal Minoan civilization which existed at the same time Akrotiri flourished on Santorini. There was much more to the Minoans, of course. Recent discoveries have revealed their close relationship with the sea-trading Phoenicians, and with the Greeks who came after them. Crete is so large that it is almost a misnomer to call it an island. The ancients referred to it as a continent because of its mountain ranges and valleys. From the former Minoan palace at Phaistos, for example, one sees the panorama of the Mesara Plain spreading outward to the distant mountains and sea. Crete also extends far to the west toward the Greek mainland and far to the east toward Asia Minor. Many treasures from this time are preserved by a wonderful woman named Nota Dimopoulou, director of the Iraklion Archaeological Museum on Crete. The stone temples of Malta are recognized as the oldest human buildings still standing in the world. The one at Ggantija with its huge, rough stones loomed high above a hillside just outside the town of Xaghra and is still very impressive. Dating from 3600 BC, it is perhaps the oldest of these temples which the Maltese dedicated to their women and their ancestors. Over the centuries the people of Malta refined their stoneworking skills and carved the huge rocks to be very smooth and rectangular. One of their later temples at Tarxien shows how these massive blocks were cut so perfectly that they fit together exactly and required no mortar to hold them in place. 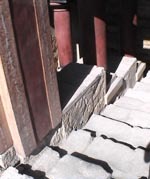 This is a style which would become known as ashlar stonework. 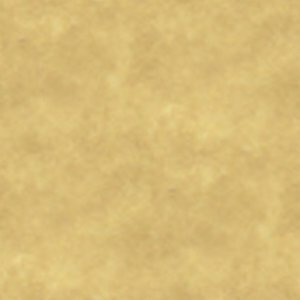 Intriguing designs were added using carvings and ochre paint. The Phoenicians are understood to have come to Malta at this time, and continued to return for many centuries. This island was an essential port for repairs and provisions on their trade routes across the ancient Mediterranean. Today the fascinating places which remain are maintained by my friend Reuben Grima, the curator of World Heritage sites on Malta. Cyprus is a curious island in the eastern Mediterranean which is always on the fringes of history but almost never center-stage. Roughly the same size as Crete, with high mountains and miles of seaside shores, it seems to have constantly been the object of a tug-of-war between Greece, Anatolia and the Phoenicians. Even today Greeks and Turks still divide the island between them. This is the home of the goddess of love, Aphrodite, whose roots go back to the reverence for Mother Nature which was held by the original Cypriots, as well as by the Phoenicians and much of ancient Europe. Today the foundation of a great Phoenician temple dedicated to the one they called Our Lady still stands in Kition. It is hoped that the spirit of Aphrodite will someday return to all the people of Cyprus and to the surrounding lands. As incredible as it may seem, you can still walk where Socrates and Pericles once strode across the Acropolis and through the ancient Agora of Athens. 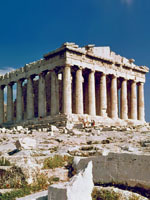 After more than two thousand years some of their unique buildings such as the Parthenon and the Temple of Hephaistos still stand. Also still there are the remarkable Greek people, who still drink their local wine and sing local songs after all this time. Truly an exceptional place and experience. When I get a chance, I should assemble some pictures from other journeys throughout the United States, Canada, Mexico, Japan, France, Germany, Ireland, Denmark, Sweden, Belgium Luxembourg, Spain, Italy, Switzerland, Austria, Greece, Israel, Jordan, and Morocco, in addition to the countries shown above.